Six Sigma Methodology seeks to improve the quality of process outputs by identifying and removing the causes of defects (errors) and minimizing variability in manufacturing and business processes. It uses a set of quality management methods, including statistical methods, and creates a special infrastructure of people within the organization called “Champions”, “Black Belts”, “Green Belts”, “Yellow Belts”, etc., who are experts in the methods. Manufacturing and business processes have characteristics that can be measured, analyzed, controlled and improved. In recent years, practitioners have combined Six Sigma ideas with Lean Manufacturing to create a methodology named Lean Six Sigma Certification. The Lean Six Sigma methodology views lean manufacturing, which addresses process flow and waste issues, and Six Sigma, with its focus on variation and design, as complementary disciplines aimed at promoting “business and operational excellence”. Companies such as GE, Verizon, GENPACT, and IBM use Lean Six Sigma to focus transformation efforts not just on efficiency but also on growth. It serves as a foundation for innovation throughout the organization, from manufacturing and software development to sales and service delivery functions. 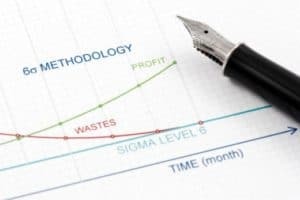 Six Sigma projects follow two project methodologies inspired by Deming’s Plan-Do-Check-Act Cycle. These methodologies, composed of five phases each, bear the acronyms DMAIC and DMADV. DMAIC is used for projects aimed at improving an existing business process. DMAIC is pronounced as “duh-may-ick” (<ˌdʌ ˈmeɪ ɪk>). DMADV is used for projects aimed at creating new product or process designs. DMADV is pronounced as “duh-mad-vee” (<ˌdʌ ˈmæd vi>).